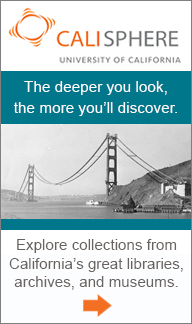 Calisphere is visited a million times a year by undergraduates, K-12 students, teachers, professors, genealogists, artists, and other curious people for their personal and professional projects and endeavors. Help us spread the word about this great resource to your patrons, friends, and colleagues. 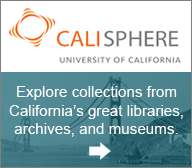 Items on Calisphere can be easily shared on social media. On each item, look for the Twitter and Facebook buttons. Send it to your followers with a single click. Place a banner on you website or blog post to direct people to Calisphere. Choose from three sizes to fit your space. Each banner links to the site. Simply cut the code below and paste it into your HTML in the place where you want it to appear. We welcome opportunities to introduce Calisphere to diverse audiences. We are happy to supply language for articles and blog posts, and can be available for virtual and in-person presentations (subject to travel and staff resource considerations). Please contact us with your outreach ideas.